It’s such lovely weather this week but instead of fiddling around with my camera outside I’m stuck indoors thanks to scoring a translating job that has to be done by June. It’s 128 pages long and I’ve done maybe 30 pages?? Plus I have an interview that I have to write up for Peppermint. So of course what am I doing? Blogging. Despite the fact that I don’t have much to say, or a huge fanbase who must be sated regularly. Meh. Actually I do have a fair bit I want to post about but I really do need to stop faffing about, so today I’m just putting up a picture of some objets (a fancy French word for “stuff that doesn’t actually have a function but looks pretty”) on my sewing table. The cats were from a flea market in Japan, I had to buy both of them as I didn’t want them to be lonely (yah, they’re porcelain but who’s to say they don’t have feelings?). They’re sitting on the base of a basket that I made myself at a basket weaving class where I discovered that weaving a basket takes a really long time and anyway, it looks good as a placematty thing for the cats, so it’s staying that way. Behind them is the lid of a tin that I bought at Camberwell market on the Easter weekend. Even I am a bit mystified as to why anyone would buy just the lid of a tin, but it was 50c and I love the picture. The woman selling it reckoned it was really old and had been in her family for ages and the tin itself had rusted away to nothing. I said it was beautiful and she agreed and said she loved it. So I have no idea why she was selling it but hey, her loss. Anyway it looks good behind the cats, and they seem happy, but I’ll have to be careful next time I use my overlocker as the vibration always makes the cats jiggle around – one minute they’re all friendly with each other and the next they’re back to back as if they’re about to have a fight like in a western movie – so who knows what could happen once this lid is added in to the equation. Potentially a formula for smashed porcelain cats. at least in your style wilderness you managed to find beautiful objets in op shops… in my local shops it's more like a holding pattern for landfill. Love those cats and the description of what happens when the overlocker jiggles them! 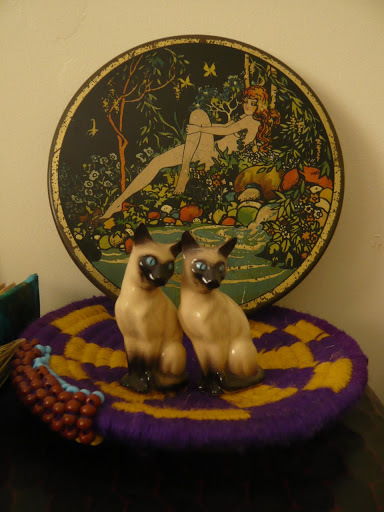 Well the cats were not actually from a style wilderness, unless you count Tokyo in that description… I'm sure you'd still be able to find loveliness at your op shops, you just have to dig deep! !